Above: Inara, with her "what the heck are they DOING to me?" face. We know it well. Oh yeah, baby. We're awesome. 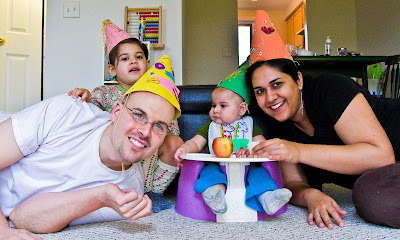 To be clear, we don't really "do" half-birthdays after the first one...it's just too hard to keep it up (big revelation here: we're LAZY parents. Deal with it). Plus you can't really compete with the first half-birthday anyway, so why bother? Well, apparently nobody explained that to Inara. Two nights ago I realized that Nissa was going to be 8 months old, and wait for the logic here...that meant it was January (yes! I got the month right! Hooray and Huzzah! 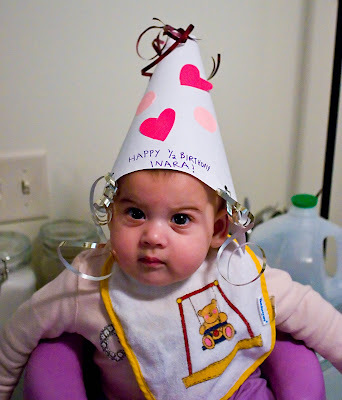 ), and that meant...that both Inara and I had half-birthdays coming up (Inara's birthday is a day before mine. Six months later. In July. Wait - was I right AGAIN? Yay...Mama's extremely limited math skills have not been badly damaged by procreation! Celebrate!). 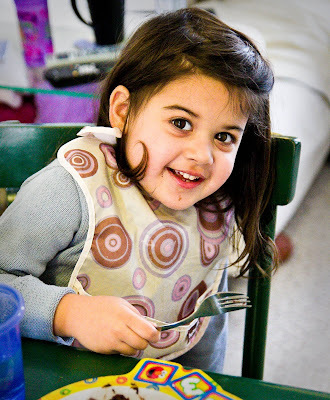 I told Inara that she was going to be three and-a-half soon *sniffle*, and her beautiful eyes lit right up. I could see what was happening, so I tried to deflect, but it was too late. She is just such a seasoned pro at out-reasoning me and to be honest, Nissa did just have a half-birthday celebration (and by celebration I mean we made hats and ordered take-out. Because we're classy like that.) so it was fresh in her mind and how could I refuse??? Me = Sucka!!! Luckily, all Inara reallyreallyreally wants in life when it comes to Food That I Love But My Parents Won't Give Me is donuts. So all it took to make my big girl happy was a frosted chocolate donut. With sprinkles. That's it. Happy three and-a-half birthday, sweet girl. We do so love you! The half-birthday girl, eating her donut with a fork. Because why WOULDN'T you do it that way?